My Huck Gee 8" Skullhead Dunny Black arrived today. It apparently sold out in under 2 minutes on Kidrobot.com, but I bought mine from Myplasticheart.com instead since I got a "coming soon" email from them a day before I got the KR one. I think it sold out pretty fast on MPH as well since it was no longer available when I checked again after my purchase went through in the morning. This is the new repaint of the original version that debuted at Comic-con in 2010. 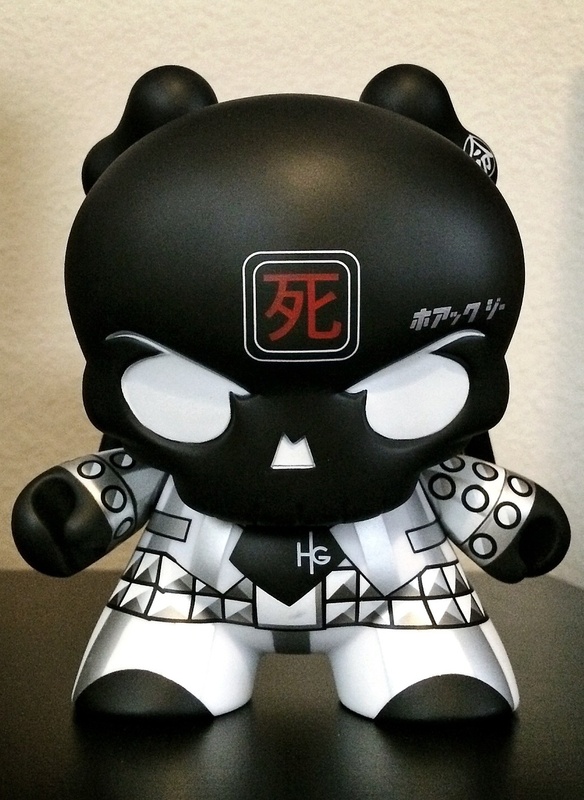 Back then, it was a limited edition GID SDCC version, then was released with a red pinstriped suit. I think this is the best version yet. Fits nicely with the black and white Sean "Cheeks" Galloway Batman already on the shelf in my loft that my wife got me for my birthday last year. Things are beginning to get a bit crowded above the TV though.